The approach for using the simple E-Mail verification, and the list analysis is described. 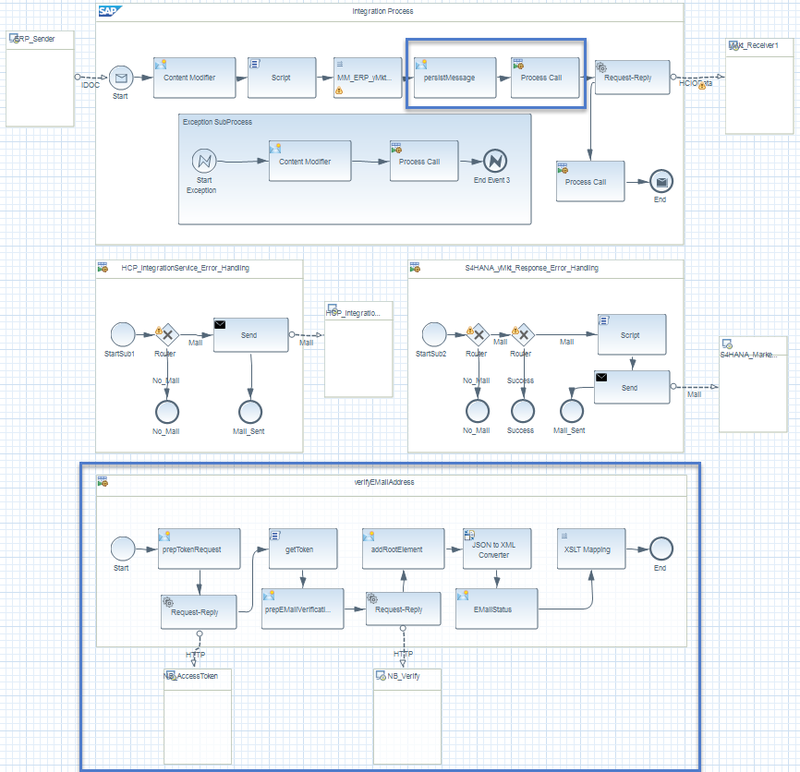 Further, the implementation approach on SAP Cloud Platform Integration is described. For many use cases, you might like to have an analysis of your E-Mail addresses first before downloading the list of verified E-Mail addresses. Neverbounce provides an API to run free analyses on you E-Mail lists. The free analysis API allows you to determine your overall list health. Instead of running the full verification immediately, we analyze the list and decide, based on the bounce estimate value, if we need to run a full verification of the E-Mail List or can send out the campaign. The procedure for running the E-Mail List Analysis is very similar. When sending the request for verifying the list, you just need to add the additional parameter run_sample=1 to the request message. Like with checking the status of the full list verification, you need to check the status until the analysis is complete. When the analysis is ready to download, Neverbounce returns a status=3. Neverbounce provides an bounce_estimate parameter, estimating bounce rate when sending out the campaign. This value is between 0.0 and 1.0, and indicated the percentage of expected bounces. With a bounce estimate below 0.02 your list is good to go, everything between 0.02 and 0.08 may need verification, with a bounce rate over 0.08 you definitively should consider verifying your list. Once you have decided to run a full verification, you can directly send the list for verification with skipping adding the list of E-Mail addresses again. Post a new request with the same Job-ID you have used with the list analysis, wait until it`s ready, download the verified list, and import the invalid E-Mails to SAP Hybris Marketing Cloud. With this you have cleaned up you E-Mail addresses and make sure only to send out E-Mail campaigns to valid E-Mail addresses. In our example shown below we use a Custom Business Object on SAP Hybris Marketing Cloud to import the analysis results to Marketing Cloud. The screenshot is taken from the eclipse tooling and hence looks a little different to the ones from the WebUI. 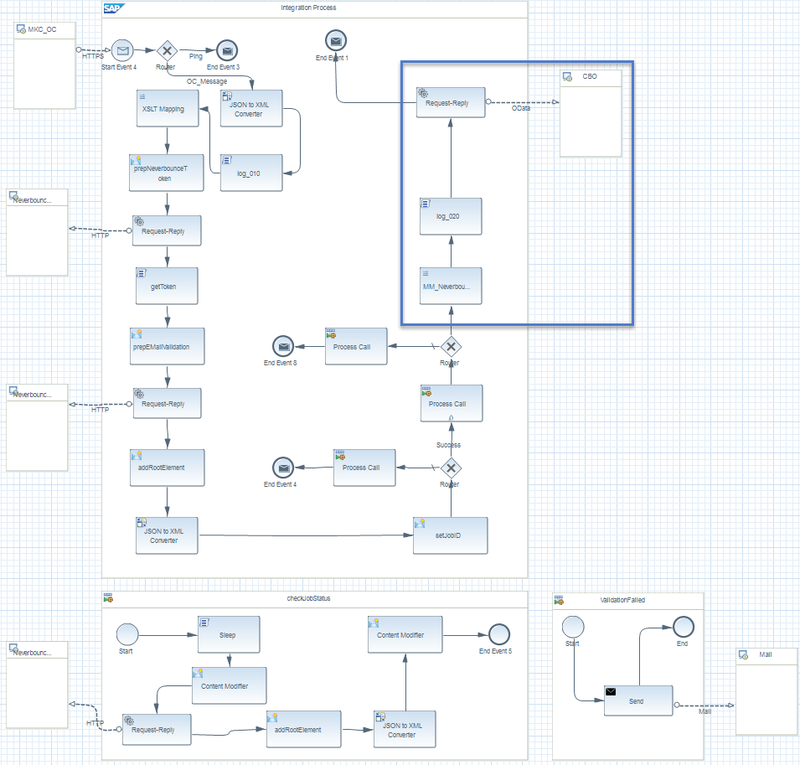 This was only done to fit the whole Iflow on one screen and does not have any technical implications. Let’s consider another use case. We replicate Account data from out SAP ERP system to SAP Hybris Marketing Cloud. Before importing the data to Marketing Cloud, we like to make sure that the E-Mail address send from the SAP ERP system is valid. When the E-Mail address is invalid, no E-Mail address is imported to SAP Hybris marketing Cloud. We extended the standard content from the SAP API Business Hub (https://api.sap.com/landingPage.html) to verify the E-Mail address from the Idcos (smtp_addr). Before extending the Iflow, make yourself familiar with the single E-Mail verification API. This scenario is simplified and explanatory. First, the message after the mapping is persisted and the E-Mail address extracted from the message body and written to an exchange property. Then, we call a local process to carry out the single E-Mail verification. This is done in the main process. Like with the List verification, first we need to request the access token from Neverbounce. With the access token available, we can now prepare the request message to validate a single E-Mail. Next you can prepare the request for verifying the E-Mail with Neverbounce. Build a request message to verfiy the single E-Mail address extracted from the mapped message from the main process. Neverbounce will provide you with a response, indicating the validity of the E-Mail. Convert the Response message to XML and extract the value from the result field. Save this value to an exchange property. The result value determines if the E-Mail address is valid or not. When the E-Mail address is not valid, not E-Mail should be imported to SAP Hybris Marketing Cloud. In that case, we defined an XSLT mapping what updated the E-Mail in the message body depending on the Neverbounce response. In our example setup, used in this blog post, we have created a list of dummy E-Mail addresses for testing purpose. The lists we have used for performance testing are very dirty, including mostly invalid E-Mail addresses. If you results look like this, you seriously need to think about cleansing your data. For verifying E-Mail addresses this is really the worst case, performance-wise. Since we’re polling the status every 30 seconds there might be an offset of maximum 30 seconds. Sending E-Mail to invalid E-Mail addresses does not only cost you money (depending on your ESP vendor), but also impact the outcome of you campaign. Verifying you E-Mail addresses is an easy and forward task, that can increase you campaign success, and of course, increase data quality. SAP Hybris Marketing Cloud provides you a powerful tool to help you understand your customers. So, you should make sure that you can reach as much of you customers and proved the content relevant to them. Make sure the E-Mail you’re sending you E-Mail campaign to is valid. Neverbounce can help you verifying the E-Mail addresses in you Hybris Marketing system. If you are not convinced that some of your E-Mail addresses are not valid, just do a free analysis with the Neverbounce Analysis API. This will give you an idea on the overall health of the E-Mail addresses you have in your system. Thank you for your analysis it was very helpfull actually. I also use an email validation tool different from yours https://www.zerobounce.net/ it is called. It is very helpfull with my validating my emails.